I remember the first time I laid eyes on this wild-looking tree. I was in Costa Rica walking down a sleepy road and found these bizarre fruits hanging about. I saw the shape of the nut at the base of the fruit and knew what it was almost instantly. 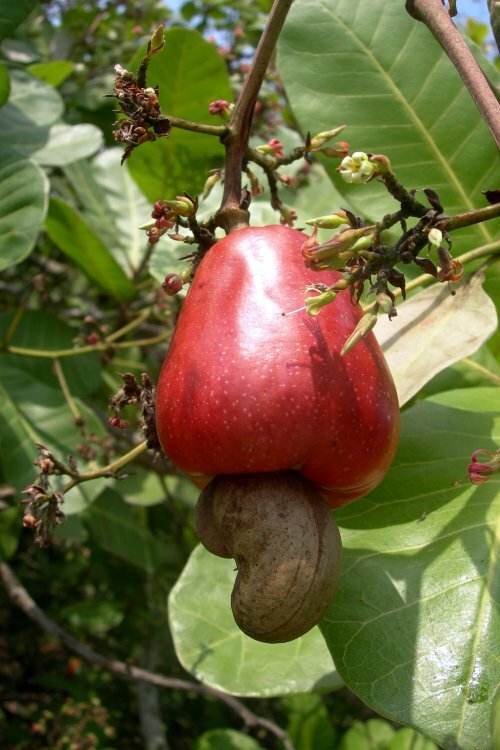 Cashew. Inside that bean-shaped shell, underneath the cashew “apple” was the meaty, nutty kernel I loved. So, in honor of meeting cashew in person, here’s a great recipe from the folks at Nutiva (they sell organic coconut oil, hemp seeds and such). Normally, I don’t play around with recipe cards like this, but I’m glad I did. And, I’m sure you’ll thank me later after you’ve whipped up your first recipe! And, let me say that everyone that tries this pudding gets the most satisfied look on their face. After the first bite, they are quiet and ponder a bit as its definitely a new texture and there are new flavors…and then, they just keep digging in. One of my friends looked up while eating and said, “it tastes like a cloud would taste,” and then smiled and continued eating. I now call it “cloud pudding.” Nuff said. Soak the cashews in water with a little sea salt the night before (or 4-6 hrs). The next day, rinse and set aside. Melt coconut oil at a very low heat until clear. Place the cashews, water, hempseed, sweetener, salt, and vanilla into a blender. Blend on high until creamy. Turn the blender on low and pour in the coconut oil. Then run the blender on high again for a few seconds. Turn the blender on low again and add the chia seeds. Pour mixture into a pyrex dish (8×8 and sizes close to that), COVER, and place in fridge. Let sit for 4-6 hours before serving. Top with raw cacao nibs when serving. I also like to top with dried fruit (for me apple-juice sweetened dried cranberries are the perfect addition).